Moving into a brand-new home may seem like a dream come true—fewer maintenance issues to worry about, and nothing needs to be updated. A newly built home may not be all its cracked up to be, however. Recently built or remodeled homes can pose many health concerns, the majority of which involves exposures to indoor toxins that you and you family may not be aware of. Can a New Home Make You Sick? Many families opt to move into a brand new house versus purchasing an older one. Being a part of deciding what kind of features your dream home will have from the ground up can be very exciting. The final product of new construction appears clean, unworn, and contemporary. A lot of people get caught up in the lure of designing a new home, however, and don’t consider the health consequences and toxic exposures that can come along with construction or remodeling. Often, residents of newly built homes begin to feel ill within days of moving in. In a Greenbuildingelements.com article, the author states that after moving into the new home the homeowner may begin to experience unexplainable symptoms due to toxic exposures. Chemicals found in many remodeling materials and construction adhesives, namely formaldehyde, or other volatile organic compounds (VOCS) can cause or exacerbate respiratory problems or skin conditions. Just like when you purchase a new car or open a new mattress, there is that “new” smell for a while. *That “new smell” is the off- gassing of VOCs from newly constructed products. Families may end up spending quite a bit of money on doctors’ visits and medication in an attempt to cure these mysterious symptoms before realizing, it’s the new home itself that is the problem. It may not be until after they realize that extended time away from home seems to “cure” them, that they suspect that chemicals in the house may be to blame. Is Your New Hom Toxic? 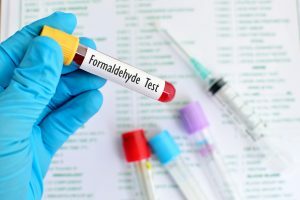 Formaldehyde is well known by name to be a harmful toxin and is used in a number of industries for various purposes such as: the manufacturing of building materials – like pressed wood products (mostly as an adhesive resin), fiber board, plywood, cigarette smoke, fuel burning appliances and kerosene space heaters. In materials used for remodeling and cleaning, formaldehyde conceals itself from top to bottom, and in every corner of a new home, formaldehyde can be hidden in materials used for restoration and cleaning. Floor lacquers or finishes are a significant source of formaldehyde in the home, the U.S. Green Building Council said, out of any household products, they emit the most VOCs. Oil finishes are more toxic than water based ones, with some containing up to 450 grams of VOCs per liter and off-gassing for longer periods of time. Other sources include molded plastics, such as those used in plastic crown molding or other fiberglass reinforced products. The resin utilizes formaldehyde that’s intended to make those products wear resistant. You’ll find that these materials are those that primarily emit that “new” smell, which is when they release toxic chemicals into the air. Paint, paint strippers, and other solvents all often contain formaldehyde. Formaldehyde is one of many potent VOCs these products emit when being applied. While the most rapid off-gassing occurs when these products are drying, they still can release VOCs to some extent for many years after the initial application. Methylene chloride is an organic compound commonly found in products like paint thinners or solvents. In its pure form, it is colorless and gives off an almost sweet smell, which is one of the ingredients that gives paint thinner its characteristic odor. Some aerosol cleaning products or pesticides may also contain methylene chloride. The substance is a known carcinogen and has also been shown in studies to cause damage to the cardiovascular system, nervous system, and liver. Toluene is another organic chemical found in paint thinners, and also attributes to its familiar odor. Cement, glue, cigarettes, certain fuels, and some dyes and paints also contain this chemical. Its gasses vaporize into the home environment and can cause symptoms like fatigue, headaches, dizziness, or even hallucinations when ingested in high amounts. Some other products may contain the toxic substance carbon tetrachloride. Before the 1980’s, this organic compound was widely used in fire extinguishers and some solvents. It also can be found in some refrigerants or cleaners. The discovery of carbon tetrachloride is a hepatotoxin, meaning that its ingestion can have severely adverse effects on the liver. Prolonged exposure to this VOC can also lead to breaking down of the kidneys, irreversible damage to the central nervous system, and even death in extreme cases. 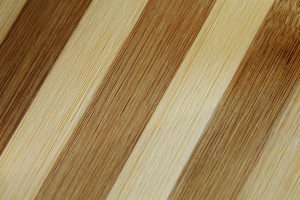 If you have ever been in a home during the process of refinishing a wood floor, you may have experienced the potent smell and the adverse symptoms that often accompany that process. Sanding and staining a hardwood floor can restore its appearance, but the job also introduces many harmful VOCs into the air. Many home buyers moving into a new home are having the original hardwood floors restored and stained. The stain and sealer used, contain a myriad of organic compounds that will off-gas into the air for days and months after being applied. Hardwood floor refinishing products usually contain high concentrations of VOCs such as formaldehyde, toluene, and arsenic. Other lesser known compounds include xylene and benzene. All are vaporized into the air as you apply it to the floor, and as they are drying. If you are in the home during this process or in the days after, you will likely experience headaches, scratchy throat and eyes, and even depression. Proper ventilation can minimize the adverse effects of these finishes, during and after the work is being done, but that tactic still will not be sufficient to remove the VOCs enough to reduce the health risk adequately. Carpeting is another major source of potentially dangerous toxins. New carpet, like other synthetic processed materials used in home remodeling and decorating, off gasses when opened and rolled out, because its contents are made up of a wide array of chemicals. The “new” smell also usually can be detected when you install a new carpet. The smell is due to those VOCs releasing into the air. Common VOCs found in new carpet include formaldehyde, benzene, and toluene. The backing used, as well as the adhesive, padding, and even carpet material itself, are often treated with chemicals intended to reduce the risk of fire or pests. Those same chemicals, however, are what cause greater risk. If you are in a new home where the new carpet has just been put in, you can start to feel sick that same day, and can feel symptoms for days and weeks after. The toxins will be strongest in the air for the first 72 hours after the carpet is laid out but will linger. Symptoms of exposure include a headache, dizziness, and respiratory problems. Young children or babies are the most vulnerable and can experience serious breathing problems when exposed. Many pieces of manufactured furniture have the same types of chemicals as carpet. Some are intended to make the furniture flame retardant, others to reduce the risk of stains, dust mites, or other wear and tear. Also, the glue used in many furniture fixings typically contains toxins like formaldehyde. Those chemicals and their gasses and particulates emitted have nowhere to escape when they sent packaged furniture from the warehouse. Therefore, when they are opened up upon arrival to your home, they release a high concentration of chemicals into the air. Off-gassing of furniture can be sped up by ventilating the room it is in—opening windows and turning on fans. Alternatively, new furniture can be placed outside to off- gas. Taking these steps does not eliminate the presence and the risk of those chemicals, though. It can take up to a year for furniture to finish off-gassing, and even then, it may continue to release harmful toxins. Until then, using the new furniture may cause symptoms like skin rashes or eye and throat irritation. It can cause symptoms, even if you don’t physically touch the furniture and being in the same room. When moving into a new house, many families want to keep it as clean as possible. You may be tempted to purchase high cleaning products to keep your home at its freshest. 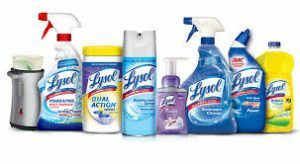 Cleaning solutions and disinfectants are meant to protect us from harmful bacteria and other triggers that can cause health problems. They are usually made up of very adamant chemicals that are strong enough to wipe out dangerous microorganisms. Those same chemicals can also be making you sick. What’s worse, many consumers combine multiple cleaning products, which not only introduces compounds into the air that are dangerous in and of themselves but can be even more noxious when mixed. Cleansers that include bleach, a biocide, are known to increase symptoms in those who suffer from asthma or other respiratory problems. Products like laundry detergent, toilet cleaners, or abrasive floor cleaners may contain chemical based fragrances that also can cause adverse symptoms. Many contain triclosan, a substance that can react with sunlight to create indoor smog. These combinations of substances can cause someone exposed to them to suffer from new or worsening symptoms, especially if they have asthma or chemical sensitivity. Spray foam is a method of insulation that is becoming more widely used in new homes. Spray foam insulation is meant to be a more flexible alternative to traditional insulation and made from polyurethane. Right at the construction site, they create a mixture of many complex chemicals that can be sprayed and conform immediately to any space. It has proven to be very effective at reducing the incidence of outside air flowing throw cracks in walls, and it is heat and moisture resistant. While this innovation in insulation may be efficient at doing its intended job, it can cause short and long-term health consequences for residents exposed to it in their homes. These contents found in polyurethane contain isocyanates that aren’t fully deactivated, or cured. Most products that contain polyurethane will get preserved, and harmful isocyanates don’t get released into the air. Spray foam, however, contains these chemicals in their fully activated state, and their release into the air can cause significant health concerns for those with exposure to it. It causes irritation to the eyes, throat, and lungs, and especially exacerbates chemical sensitivities. The garage is a potential danger zone regarding toxic chemicals. Stored fuels, octane boosters, and other auto maintenance products can contain VOCs and other compounds. Toluene, in particular, is found in stored octane boosting products. Petroleum products, even when kept stored in the correct conditions, can undergo autoxidation in which particulates from the fuel are changed chemically and released into the air. Petroleum or the containers that hold it can give off VOCs such as benzene, toluene, hexane, and cyclohexane. Benzene, in particular, is cause for concern. It evaporates into the air, but its molecules are heavier than that of air, so it sinks and therefore does not dissipate as quickly as some other VOCs. When ingested even in small quantities it can be very dangerous and can lead to cardiac distress, dizziness, and vomiting. Automotive products such as refinishing products or detailing chemicals can contain hydrocarbon; an explosive compound can be emitted from auto products, even when sealed. Also, emissions from a car engine contains this compound and found in garages where cars are parked. Especially if the garage door remains closed most of the time, these can build up to dangerous levels and can cause serious health effects if breathed in regularly. What is a Safe Level of VOCs? The obvious answer would be zero—no one wants to be in an environment with any known toxic substance. It is nearly impossible, however, to find a space where there are no VOCs present, even outside. All houses contain these or other harmful chemicals to some degree. What, then, is a safe level of VOCs to have in your environment? *What is “safe” is different for each chemical? They may react with each other in various ways, as they combine many chemicals in the air at one time. It is tough, then, to calculate a defined limit of the maximum level of VOCs should be in your home. The best strategy is to try to restrict the amount of VOCs introduced into your home in the first place. In addition to air purification, proper ventilation is essential in a new home. Don’t buy more of toxic chemicals than necessary—for example, only buy as much paint or paint thinner as you need, don’t buy extra to save for a future project. Use old furniture when possible versus purchasing new. In a new home, using VOC-containing materials may be inevitable to some extent, because all of the new products and construction, but taking these steps can alleviate the problem slightly. After about a year, a new home and its new materials will stop off-gassing at such a high rate as the VOCs and other chemicals are diluted and no longer emitted. That doesn’t quite help during the meantime, however—during those twelve months a lot of damage can be done to one’s health if something is not done to reduce the level of toxins present. The best thing you can do to counteract harmful VOCs is through excellent cleaning and air purification products. To get the job done, you need a technology that doesn’t just mask odors or catch toxins only to release them back into the air—rather, the solution must be a product that will capture and neutralize those chemicals. EnviroKlenz offers a range of products that do just that. The EnvironKlenz Mobile system is a multi-stage air purification solution that can cover up to 950 square feet. It works in a two stage filtration product which incorporates a medical grade HEPA filters that capture particulates of up to .3microns. Next stage focuses on chemical odors and VOC neutralization by utilizing their patented earth mineral filter that destructively adsorbs and neutralizes the VOCs and other large allergy-causing triggers from the air. 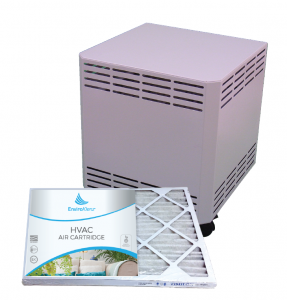 The easy-to-install EnviroKlenz HVAC filter is more effective than traditionally used carbon filters for destroying and neutralizing stubborn odors. For flooring, carpet, and furniture, and other solid surfaces, the EnviroKlenz Everyday Odor Eliminator can do the job. Using the same proprietary technology, it gets to the core of the problem and breaks down harmful chemicals. 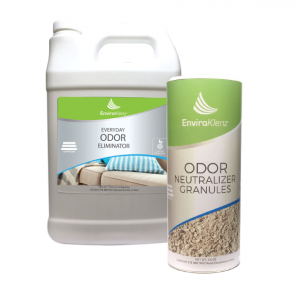 The EnviorKlenz everyday odor eliminator can be used to remove formaldehydes from new carpet , clean and deodorize hardwood flooring, and neutralize chemical odors from walls and solid surfaces.